We are a casual group of dancers, but not too casual. Jeans & shirts are the norm for all of our classes, and even sometimes work clothes. We have a restroom on premises if you need to change. But, please, workout clothes should be reserved for the gym. In time you'll find that dance shoes are amazingly comfortable and perfect for dancing, but until then just wear anything comfortable that will stay on your feet. Flip flops are banned from the studio. Heels for women are a personal choice, but nothing over 3" please. Internet, phone, in person - whichever method you find easiest, we are here to help. Our class schedule can be found here on our website, through which you can register. Or you can just wait and register when you come in for your first class. And if you have any questions, we're just a call or text away. Do you offer a first free class? Because we have quality instructors who need to be paid for their services, we don't offer free classes, however, you can come and take your first class without pre-payment. You can register online without payment, or come in to register. That way, at the end of the class, when you've had an amazing time and you've fallen in love with the studio and the other students, we can discuss your options for payment of the class you took plus future classes. That way you get the freedom to choose a package after you've tried a class. If you are new to the studio and coming to take your first class, please arrive 10 minutes before the class start time. Dancing isn't to be watched - it's to be EXPERIENCED!! Because of that, and as a supportive environment for those wanting to learn, we don't allow anyone to be in the room and just watch a class, because if you are in a class trying to learn, you probably don't want anyone watching you, right? But, the studio is designed in such a way that you can speak to someone at the front desk and see a class in progress to get a taste of the friendliness of the staff and students, the fun everyone has learning, and the supportive community that we are. We allow new student drop-ins for Beg/Level 1 classes ONLY! We have created an amazing system to teach the fundamentals for all of the classes we offer, and we need everyone in Int/Level 2 classes to all have the same education. 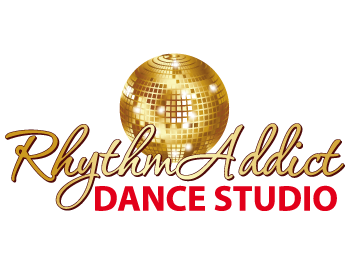 Please plan to come in for a Beg level class as your first class here at RhythmAddict as you will not be allowed in any higher level class, no exceptions. Also, it is very important that you arrive on-time to take your class. We stick to our schedule and start classes on-time. If this is your first class, plan to arrive 10 min early to complete registration. Any arrival for any level of class after 15min, will be denied entrance to the class, no exceptions. We love fun, friendly, and respectful people. This is a family, full of encouragement and support. This is also a meeting place of many singles, but it is not a meat-market. Come for friendship and a new addictive, but healthy, lifestyle. We pride ourselves on creating new dancers every day. Are you next?